The civil rights movement in the U.S. involved black Americans (and others of African ancestry), because these are the people who were impacted the most from jim crow/segregation in the U.S.
Sure there were a number of whites, Asians, Latinos, and Native Americans who believed in equality and marched during the civil rights movement, but the numbers are small when obviously compared to the number of African Americans who died and fought for civil rights in America. All blacks were impacted by Jim Crow/segregation, therefore ALL blacks were involved in the movement in some way. The same is not true for other groups. That doesn't make what you said any less absurd or ignorant, black people do not deserve ALL the credit. This is a fact: Millions of non black people were not sprayed with hoses, killed and jailed, like many blacks were. You're right, and millions of black people were also not sprayed with hoses, killed or jailed like many blacks were. Don't be stupid, there are countless non-black people in this nation's history who deserve credit for the civil rights movement. I replied, BLACKS. Say what you want, but deep down, you know that I'm correct. Without blacks mobilizing on a massive scale for civil rights, there wouldn't have been a movement. The executive and legislative branches simply did what was necessary to keep the cities from burning to the ground. LBJ may have invented the tactic of making false accusations of racism that has plagued us so much in the past 20 years, and held back progress towards MLK's dream. In 1964 LBJ ran against Goldwater. Goldwater was an ardent desegregation guy. He had pushed it forward as a Air Force officer, and as a business owner in AZ. In the South the LBJ campaign portrayed Goldwater accurately in order to try to turn the southern white vote against Goldwater. In the North, the LBJ campaign portrayed Goldwater as a racist and Klan sympathizer, even distributing children's coloring books with Goldwater dressed up in KKK robes. The millions of blacks who died and were jailed while fighting for civil rights, deserve ALL of the credit. Deep down inside I know you're just ignorant of the facts. 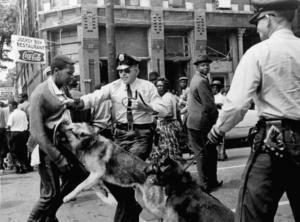 People of all colors deserve credit for fighting for civil rights and people of all colors were beaten and killed fighting for civil rights. A few whites, Asians, Native Americans and Hispanics marched and partook in the civil rights movement. I would never state that there are millions of blacks and whites marching currently with Latinos to change the immigration policies, so please stop the revisionist history with the civil rights movement. It was not led by whites, Asians, Hispanics or Native Americans. It was led by blacks. Again, that's not what you said therefore you were still wrong and yet you insist on pushing these lies. And who deserves more credit, non blacks or blacks? I have never heard of hundred, thousands or millions of whites, Asians and Hispanics fighting for civil rights in America alongside blacks.